China's vast distances, marked by mountain ranges, sweeping plains and deserts, ensured the success of airmail services in that country. What was accomplished in days of road and river navigation took just hours by plane. Five airmail stamps were issued July 1, 1921 (Scott C1-5), to be used on flights from Peking to Shanghai starting that day. Figure 1. China's first airmail stamps. The left stamp was issued in 1921 and shows the Republic emblem on the tail. The 1929 stamp at right shows the Nationalist emblem instead. As shown at left in Figure 1, the central design of the stamps features an airplane bearing the emblem of the Chinese Republic. These handsome stamps are denominated 15¢, 30¢, 45¢, 60¢, and 90¢. The basic airmail rate then was 15¢ in addition to the normal postal rate. Carried by train the 450-mile distance from Shanghai to Tsinan and then 230 miles by air from Tsinan to Peking, an estimated 400 pieces of mail, including newspapers, were flown on that first flight. Only a handful of the mail was registered. Figure 2. Cover carried on the 1921 first flight of China's aerial postal service. The stamps are canceled by a large 20-character black box commemorating the maiden flight. A large 20-character black box canceled the airmail stamps, as shown on the cover pictured in Figure 2. The message translates as "Mail Carried by First Flight of the Aerial Postal Service Established by China". Canceled-to-order, never-flown covers bearing the full set of stamps exist. Large die proofs of the issue are rare. Specimen sets are found without gum. 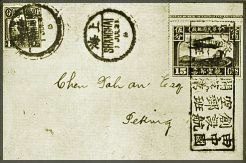 A set of three stamps was prepared but not issued for the 1824 Peking-Mukden flight. As such, these stamps are not listed in the Scott Standard Postage Stamp Catalogue. Figure 3. Stamp prepared for the 1924 Peking-Mukden flight, as illustrated in the 1992 Chan China catalog. The 1992 Chan Colour-illustrated Stamp Catalogue of China, with values in U. S. Dollars, illustrates the 30¢ stamp, shown here in Figure 3, and values the 15¢, 30¢, and 40¢ set at $300. Cancellations on these stamps are unreadable and are in red or black. The set also can be found with SPECIMEN overprints. Perforated and imperforate facsimiles and an imperforate souvenir sheet bear four Chinese characters on the reverse noting that the items are facsimiles. Nonetheless, the souvenir sheet at auction realizes about $150 or more. The basic five-value 1921 airmail design was revised in 1929 to place the new Nationalist badge on the tail of the airplane (C6-10) as shown at right in Figure 1. These issues were first used on the July 8 Shanghai-Nanking first regular flight. Thousands of covers were flown in both directions. A special propeller-blade postmark ties airmail stamps on covers flown on the Shanghai-to-Nanking flight. Variations in shade are known of the 15¢ and 30¢ values. Large quantities of used 15¢ stamps are readily found, indicating that the use of the airmails was popular. The western Chinese province of Sinkiang is surrounded on three sides by mountain ranges. The Sinkiang postmaster received permission from the directorate general of posts to apply by hand a two-character "Par Avion" ("airmail" in French) overprint on four stamps (Sinkiang C1-4). These were issued in 1932-33 for flights to Peking and Shanghai. Counterfeits are widely found, both on and off cover. Collectors should use caution and purchase expertised examples. China's third airmail issue of 1932-37 is another horizontal stamp, depicting a Junkers F-13 monoplane over the Great Wall. As postal rates changed, 10 stamps were issued in three stages (C11-20). Specialists classify varieties of these stamps as narrow or wide. The designs on narrow stamps are 22½ millimeters by 41mm; the wide measure 22mm by 41½mm. Hong Kong's Commercial Press printed the 1940-1 watermarked and unwatermarked airmails. Hostilities between China and Japan necessitated the transfer. The 1932-37 Peking print is perforated gauge 14, while Hong Kong issues are perforated gauge 12 to 13. 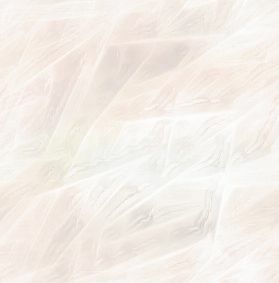 Peking's gum is yellow, thick, and bright; Hong Kong's is white, thin, and dull. Figure 4. Examples of the Peking (left) and Hong Kong (right) printings, with the "piao" character secret marks illustrated. On the mark at the right, the lower-left protrusion is separated. The original and redrawn Piao characters, containing what Scott catalog refers to as the secret mark, are shown next to the $5 stamps in Figure 4. In the redrawn issue, the lower-left corner of the character is separated. In 1941, Japanese-occupied Central China issued six overprinted denominations (9NC1-7). The 10-sen-on-50¢ stamp is known in two types, depending on the proximity of the "10" to the "sen" character overprint. Both are common. The 20s on $1 surcharge was applied to both watermarked and unwatermarked Hong Kong airmail stamps. The watermarked issue (8NC3) was found by collectors only in 1943 and is the only expensive one, listing for $16 unused in the 2000 Scott catalog. The remaining stamps in the set are all listed less than 50¢ each, unused. Most genuinely used copies sell for less than $1. Sinkiang's 1943-44 provincial airmails with black wood chops (hand-struck overprints) are unlisted by Scott. These were overprinted on both Peking and Hong Kong airmails. Figure 5. A counterfeit of the key 25¢ Sinkiang airmail stamp of 1942 with forged red wood chop overprint. The 25¢ wide Peking variety with red wood chops (C6) is the key stamp and, as shown in Figure 5, is frequently found counterfeit. Figure 6. Inflation surcharge on a 1946 Chinese airmail. When the war with Japan ceased, the inflation-induced rapidly changing postal rates led to several Chinese values being surcharged in 1946-48. The $23 surcharge on the 30¢ red stamp is shown in Figure 6. Knowing the difference between the Peking and Hong Kong prints is the key to the scarce $1 Peking surcharge (C59). Figure 7. China's nondenominated 1949 airmail stamp. The green plane stamp of May 1949 (C62, C62a) is non-denominated. Sold across the country at the day's rate of exchange, it is found either perforated gauge 12½ (shown in Figure 7) or the scarcer roulette. Either way it is elusive on cover. The stamp was overprinted by the People's Republic of China in 1950 for regular postage (26, 26a). It was also overprinted in Kansu (Kansu C1), Foochow, Fukien (Fukien C1), and locally in Formosa (Formosa C1). (Air Mail" was overprinted on the $100 Dah Tung revenue stamp in blue, perforated gauge 14, (C63) and released in 1949. Complying with the new silver currency, many of China's provinces issued their own airmail stamps. Szechwan applied overprints to already-surcharged China airmails. Errors of the Szechwan issues are known. The $10,000-on 30¢ Hong Kong airmail stamp was later found on watermarked instead of unwatermarked paper (C1a), an exceedingly rare variety. The $10,000-on-$27 is known inverted on both the narrow- and wide-design issues (C2a). The single-character overprint was mistakenly printed on stamps without the $10,000 surcharge (C2b). With new currency being adopted in Taiwan to replace the old Formosa structure, a 13-value definitive set of regular issues showing Cheng Cheng-kung was released in 1950. A 60¢ airmail was added to the set Sept. 26, 1950. With the same design of the Cheng definitives, two characters meaning "aviation" were added. These stamps were annulled in 1961. In 1954, a set of three airmail values showing Chinese landmarks (C65-7) was issued without gum. Numerous imperforate-between errors exist both mint and used. Various gravure and lithographed airmail sets were issued until 1987 when regular issues were used for airmail service. In the People's Republic of China, a five-value airmail set depicting a mail plane and the Temple of Heaven was released May 1, 1951 (C1-5). Printed by intaglio recess by the People's Printing Works in Peking, these stamps are found in ungummed sheets of 50. Examples on cover are fairly scarce. The $1000 and $5000 values are known imperforate between. A four-value set showing planes in flight was released 1957-58 (C6-9). Once again, ordinary stamps replaced special airmail designated issues. For the collector seeking to know more and to appreciate Chinese stamps best, specialized reference books are available from China specialist dealers. Membership in the China Stamp Society or the American Philatelic Society is recommended for access to their fine libraries.